The 2018 Palaeontological Association Annual Meeting was held in Bristol, a university and city which hold a special place in the heart of many Association members. Following morning workshops showing attendees how to use the computer programs RevBayes and Avizo, the meeting began in earnest with the Symposium, held in the beautiful Great Hall of the Wills Memorial Building. The Symposium showcased recent work in dinosaur palaeobiology, and for the first time, the final three talks were open to members of the public. Darla Zelenitsky gave the first talk of the day, highlighting key fossils that have impacted our knowledge of dinosaur nests and eggs. Victoria Arbour discussed how to determine whether the anatomical features of an animal might have been adapted for combat. Jingmai O’Connor presented some exquisitely preserved birds from the Jehol biota which provide direct evidence of diet. Xing Xu closed the session by summarizing recent discoveries relevant to the evolution of bird feathers, flight and toes. The icebreaker followed, held in the lobby of the Life Sciences building. Attendees socialized and enjoyed canapés and drinks under the unusual owl sculptures suspended from the ceiling. Many purchased a t-shirt featuring Mary Anning or Charles Darwin with a Banksy twist, designed by Suresh Singh. 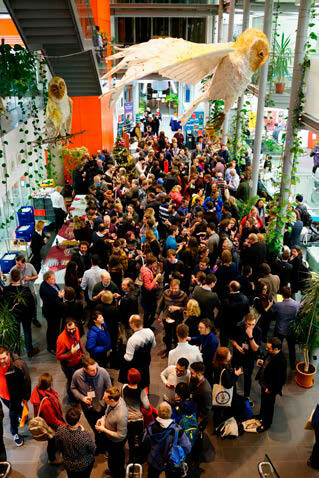 Icebreaker attendees enjoy drinks in the Life Sciences Building, University of Bristol. The following morning commenced with three parallel sessions, during which Jed Atkinson coined the “Brobdingnag effect” as the increase in body size of a new species in the wake of a mass extinction event, Bertrand Lefebvre discussed the exceptional soft-body preservation of echinoderms from the Moroccan Fezouata biota, and Elizabeth Martin-Silverstone described the first pterosaur from the Isle of Skye. Following the coffee break, the sessions resumed, including Luke McDonald using 3D photonic nanostructures in Pleistocene beetles as a window into the evolution of insect colour, Emma Landon investigating the taphonomy behind possible fossil embryos from the Ediacaran Weng’an biota, and Travis Park looking for convergent evolution in whale cochlea and its implications for the acquisition of echolocation. During the lunch break an LGBTQ+ meet-up took place, a highly successful new addition to the Annual Meeting. The first session of the afternoon included talks from Aubrey Roberts, who examined the biogeography of Jurassic–Cretaceous marine reptiles, and Holly Betts, who used gene duplication events to date life’s last universal common ancestor. This was followed by the Annual General Meeting, with an interesting insight into the results of the recently carried out Diversity Study. Rainbow trilobite badges by Marta Zaher. After another coffee break, the Annual Address was delivered by Jane Francis, who discussed the contribution of Antarctic fossils to our understanding of climate change across deep time and what that might mean for Antarctica in the future. The poster session then took place, with a plethora of excellent research on display to peruse. This was followed by the Annual Dinner in the Bristol City Museum, with attendees able to wander the galleries before being treated to some excellent food and top-class DJ-ing. The next morning began with two parallel sessions. In Session 4A, Nicola Vuolo described using synchrotron-based tomography to reveal the in-situ arrangement of conodont elements, while Christopher Rogers investigated the chemical changes experienced by melanosomes during the fossilization process. In Session 4B, Emma Dunne revealed a strong relationship between Late Triassic tetrapod distributions and contemporary palaeoclimate, while Roland Sookias closed the session by highlighting ways to make morphological evidence build phylogenies that more closely resemble those built based on DNA. Following a coffee break, we resumed with three parallel sessions, including Ricardo Pérez-de la Fuente describing some unusual insect larvae preserved in Cretaceous amber, Thomas Boag demonstrating that oxygen likely acted as a key spatial control on multicellular life in the Ediacaran, and Gemma Benevento considering the impact of the K–Pg mass extinction on mammalian jaw disparity. After lunch, a further two parallel sessions were on offer. In Session 6A, Sean McMahon discussed the challenges of working with the fossil record of seafloor microbes, while in Session 6B, Silvia Danise highlighted the importance of understanding local conditions when considering mass extinction kill mechanisms in the marine realm. After coffee, the last session of the conference included talks from Xiaoya Ma on the nature of tissues revealed by exceptional preservation in the Chengjiang biota, and Alexander Hetherington on the relatively complex path to the evolution of roots in lycophytes, with the final talk given by Duncan Murdock on using conodont fossils to test the role of gene regulation in the evolution of biomineralization. For those who remained for the final day, two field-trips were on offer. One was to Watchet, with many attendees managing to collect an iridescent ammonite or two. The other was to Aust Cliff to collect microvertebrate remains. 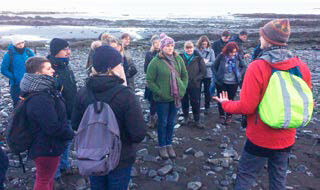 Benjamin Moon (far right) explains the geological history of Watchet. The President’s Prize this year was given to Elsa Panciroli for her excellent talk on the Scottish mammaliaform Borealestes serendipitus, making use of 3D animation to bring the animal back to life. The Council Poster Prize was awarded to Nuria Melisa Morales Garcia, who produced a highly informative and beautifully-designed poster, explaining her research on the application of 2D extruded finite element analysis as an alternative to using CT scans. Many thanks are due to Jakob Vinther and his vast team of co-organizers and helpers for making this year’s Annual Meeting a fantastic experience, showcasing a broad spectrum of intriguing research.